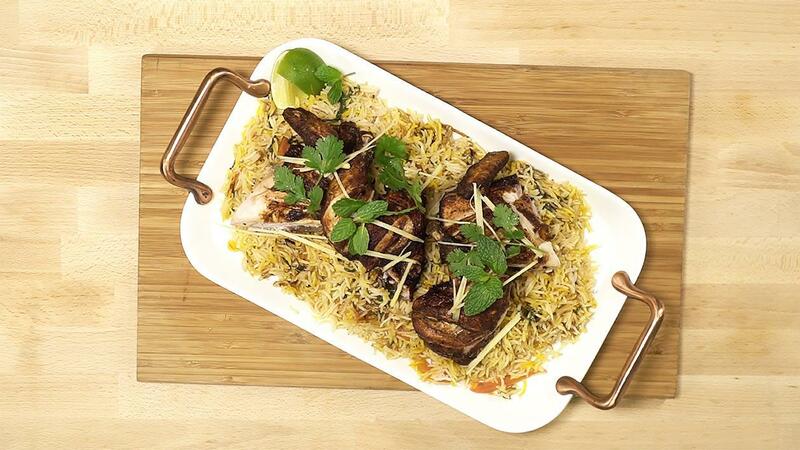 Anyone who has had Lahori Charga will not think twice before digging into this dish! Lahori style spices and colorful biryani rice complete the dish. Try this out on your menu this Ramadan season! Cut the chicken down the back bone, make deep scores into the flesh side of the chicken. Prepare marinade for the chicken by blending together Knorr Tomato Puree, garlic, Rafhan Corn Oil, tikka masala, Yogurt, Knorr Tomato Ketchup, Knorr Lime Seasoning. Deep fry the whole chicken at 160°C in Rafhan Corn Oil for 5-7 minutes. Allow the chicken to rest in the oven at 100°C. For the rice heat Rafhan Corn Oil in a large pot and add in half the fried onions, ginger, whole and powder spices along with rice. Add one cup of water and add Knorr Chicken Stock Cubes. Place tomato slices on top sprinkle with mint leaves. Add in yellow color and cover with lid to steam for 15 min till rice gets puffed up. Now serve on large platter topped with fried charga.